When most people think of Saudi Arabian clothing, the first thing that comes to mind is probably black abayas and niqab for women and white thobes and 'igal for men. However, traditional costume of Saudi Arabia is in reality much more colourful and diverse. The Mansoojat Foundation is a UK registered charity founded by a group of Saudi women with a passionate interest in the traditional ethnic textiles and costumes of Arabia. 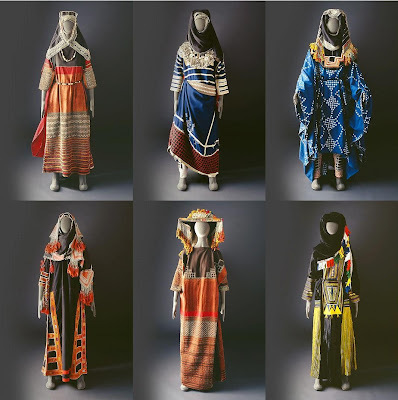 Here are some examples, visit the website to see more, and to learn about the styles of the different tribes. You can also purchase various items decorated with traditional patterns here. Wow! I never thought that Saudi clothing was ever so clourful, thanks for helping change the sterotype! That is so awesome. I thought KSA was all about the black abayas. I was surprised too when I first found it! love the idea of the blog. great contents.